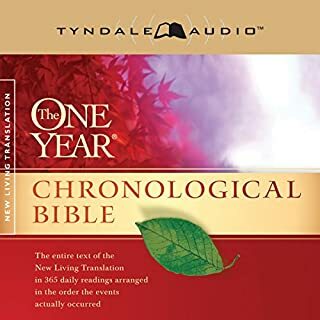 This audio puts the life-changing power of the Bible , the vibrant emotions of the Psalms, and the rich practical wisdom of Proverbs into the same easy-to-listen terminology people today use to talk to friends. Brings the Bible into the 21st century. Why does a 2,000-year-old book still matter? Why should it? 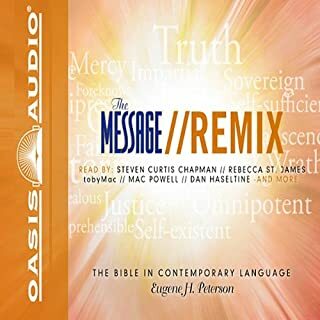 The answer is found in The Message: REMIX New Testament, today's Bible in contemporary language for tomorrow's leaders. The Message has had a profound impact on millions of people worldwide, including some of the best-known artists in contemporary Christian music today. The Message: REMIX is read by artists whose lives have been impacted by The Message. This special Message edition is the perfect gift for women of faith on the go. It is read by several leading female Christian music artists who will help you slow down to listen, be still, and draw near to God. The Breathe Bible Audio New Testament is a remarkably vivid listening experience that transports you into the world of the Bible. Performed in the New Living Translation by a cast of internationally acclaimed film, television and recording artists, this captivating multi-million dollar audio production features cinema-quality sound with an original music score. It’s an experience you will never forget. The Breathe Bible Audio New Testament -“It’s like being there.” Listen however you like! God has gone to great lengths to rescue lost and hurting people. That is what The Story is all about - the story of the Bible, God's great love affair with humanity. Condensed into 31 accessible chapters, The Story sweeps you into the unfolding progression of Bible characters and events from Genesis to Revelation. Using the clear, accurate, and easy-to-understand text of the NIV, it allows the stories, poems, and teachings of the Bible to read like a novel. An easy to understand Bible translation. Simply the best modern translation of the Bible in existence. Not for detailed study of the scripture, but the translation was written to be read like a novel, and it succeeds. Many scriptures I'd been confused over became clear with this translation. I'm eagerly awaiting the Old Testament. A Bible that Makes You Laugh? 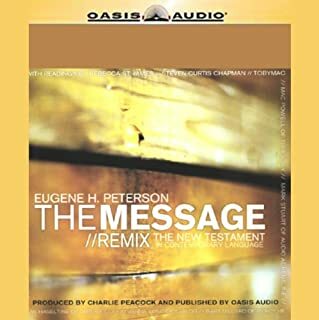 If you don't think of the Bible for "casual listening" or "pleasure listening", this version of "The Message" will challenge that opinion. "The Message" has to be among the best - if not the best - English version for listening. The prose is contemporary and engaging and Eugene Peterson does an exceptional job providing continuity of the text where other, more literal versions do not. He captures the spirit of the text well, unafraid to use emotional terms and colloquial phrases to express the points. I have found myself laughing and smirking on multiple occasions at his choice of words - well-capturing the emotional tone (funny, serious, sarcastic, etc.) of the original authors. 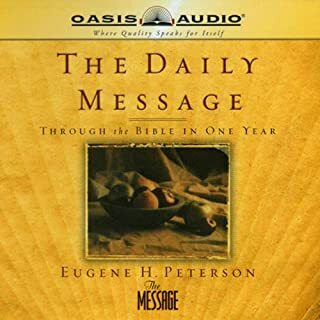 While I would never use "The Message" as my exclusive study Bible, it is exceptional for my lengthy daily commute and I find it easier to track with than the New International Version to which I have listened. And it makes the Bible very approachable to anyone who considers it intimidating or too complicated. Peterson makes it clear in the introduction that he's aiming at a thought/sense translation, not a literal one. He absolutely hits the mark. I would recommend this version to those who have never considered the Bible approachable; this version will change your mind. I can also recommend it to those who have read the Scriptures for years as this version will give you a fresh perspective. And for those who are convinced there is only one "real" version? Please remember that God expressed them through men in Hebrew, Aramaic, and Greek - not English - and that same Holy Spirit works to interpret the Scriptures for people of all tongues today - even contemporary English! God bless all who seek the truth. This paraphrase is the first Bible that speaks to my every day real life. It is a Bible that I feel I can actually do, not just read or listen to and try to figure out how do I do that in my everyday life. I'm a PK (preacher's kid) and attended Bible college and reading this is the first time in 40 years that I feel like I'm truly understanding God's word . Perfect translation for listening to. By using current idioms Peterson brings the Bible to the 20th (and 21st) century. But this translation is also very easy on the ear. We should remember the original texts were supposed to be received by listening, not an individual sitting quietly and reading. I have found changing the "input" to the ear and not the eye, has added more meaning to already familiar texts. 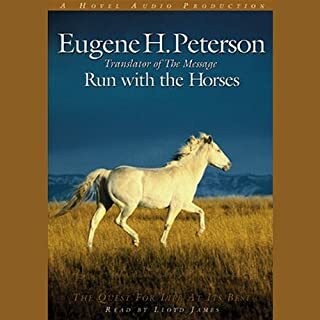 It is read in an interesting and at times exciting way, which fully captures Petersen's intent. A perfect example of the "change" from past translation: Instead of "Verily, verily I say to you..." is now " Are you listening to this? Really listening?" This is the finest paraphrase of the Bible that is in existence. Eugene Peterson makes the Bible come to life in our modern times. Highly recommended for Christians and non-Christians alike. I am a new Christian. I got the King James version and it was good but kept putting me to sleep. The Message on the other hand is so good it's hard to stop listening! The reader narrates with all the enthusiam of Tony Robbins which I think is a good thing. This version of the Bible truely breaths new life into stories and letters I've heard since I was a child. The language is easy to understand without changing the story. It is powerful and wonderful and an absolute joy to listen to! This one will stay on my IPOD for life!!! I really enjoyed listening to this version while I am doing mindless chores around the house. Since it is using modern euphemisms, colloquialisms, and slang it is very easy to follow. When terms like self-help, new-age, or even stuff (George Carlin?) are used, I grasp the meaning of His sermon like I have never before. Really worth your while to listen to. Would you listen to The Message again? Why? Yes. I listen to it when I can for a better feel of the history of the early church and their teachings. What three words best describe Kelly Ryan Dolan and Carol Nix ’s performance? Listening to the audio is a good experience with a great message and very good narrator. But finding the book, chapter and verse is abysmal. There needs to be some type of indexing and navigation to at least find the beginning of the books of the bible and preferably the chapters as well. The only thing you can do now is guess which Part and Chapter a book of the bible begins in and listen until you can confirm it. This system makes it useless for specific reference bible study. I disagree with some of the other reviewers. I think they have missed the point. This is an excellent translation that would be a great part of any bible study series. King James, on the other hand, is excellent poetry. I have gotten much more spiritual enlightenment from this document than I ever could from a more formal version. I find it hard to believe that Jesus or Paul actually spoke as formally as King James, but I find it quite plausible for them to speak in the manner found in The Message. Anyone could benefit from this book. Lighten up guys. The Message is more of a paraphrase than a translation, so it's not meant for serious Bible study. If you just want to pick up something to read, however, it's nicely done. But we're here to talk about the audiobook: This recording is simply superb! It's like listening to a novel. 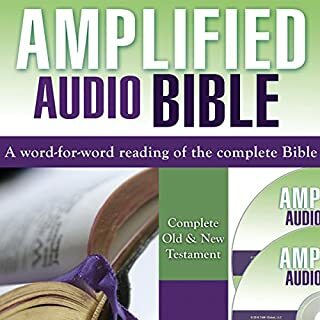 Great for readers/listeners who are familiar with the New Testament and for those to whom it is brand new. I love having this in audio book form, it means you can listen to scripture whilst carrying on with your day. I often found it hard to find time to sit down and read my Bible. Although I would make sure to try and do so everyday, often it would mean my time would be cut short. Being able to listen to this is great as it allows you to fit reading the word of God in to your day to day life, journey to and from work, cooking, house work, anywhere. As "The Message" translation is more fluid compared to others; this has helped when listening to it whilst on the move. In this format, from Audible, it comes in 3 parts. Titled Part 1, Part 2 and Part 3. This means its not easy to find particular books, chapters or verses. If this was an important feature for you, then I would suggest getting it in CD format, which would make it easier to find specific books and chapters. Otherwise I would definitely recommend getting a copy of this! Beautifully read and easy to listen to, but be warned its not so easy to put down! You may find you have spent the whole day absorbed in the word of God! 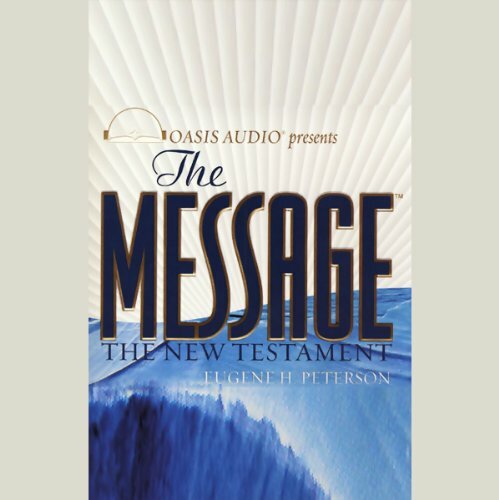 Would you consider the audio edition of The Message to be better than the print version? What was one of the most memorable moments of The Message? What about Kelly Ryan Dolan and Carol Nix ’s performance did you like? What did you like most about The Message? Peterson's poetic version of the New Testament is simply wonderful, either when read on its own or when read alongside other versions (I read alongside one or more of the following: NLT, NET, NIV & NASB). I bought my first paper copy of the Message some years ago (1993 or 1994) and fell in love with it immediately. I still feel swept away when reading it and many of Peterson's translations have given me new and fresh and vibrant insights into passages I know well from other versions. The Message is inspired and this audio version is an amazing way to experience it. Try and make time to listen to whole books at a time. Discover and experience God's revelation through a new encounter with the living Word. The words, the voice, the introductions to each chapter, it's all simply brilliant. I really do recommend this version of the bible. It has helped me 'rediscover' the bible. If you could sum up The Message in three words, what would they be? The Message is full of characters! Essentially, it is about God himself, and he is the reason for my wanting to read it. Have you listened to any of Kelly Ryan Dolan and Carol Nix ’s other performances? How does this one compare? Many spots, particularly the stories of Jesus and his passion, death and resurrection. The Message is more than "a book": it is an experience. And because it is in modern English - albeit very American in vocabulary and style - it speaks to the heart even of an Englishman. Really easy to understand and the narrator is really enthusiastic. Sometimes a little too enthusiastic but it really paid off in the books by Saint Paul. I refer to this often when I can't figure something out in another version, and I'd recommend it for everyone.